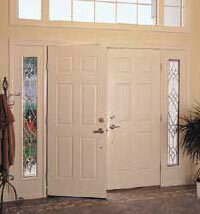 Premium fiberglass doors with the look and feel of rich wood. Beautifully detailed, our Classic-Craft doors give you all the premium touches you�d expect from the finest wood doors: A rich, natural, red oak grain Full mortised brass hinges Solid oak square edges Superior oak adjustable sill Custom look finishing choices Plus, a wide variety of decorative glass options. 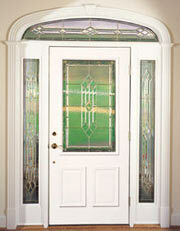 We manufacture the complete Classic-Craft door system. All components are designed, engineered and manufactured for top-quality performance and appearance. A solid polyurethane foam core offers five times greater insulation value than wood doors. The Classic-Craft exterior door with a durable, compression-molded fiberglass surface won�t dent, crack, split or splinter. It resists shrinking and swelling with temperature changes allowing the finish to last three times longer than on a wood door. 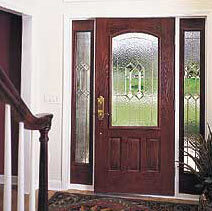 Staining Classic-Craft fiberglass doors to look just like wood is easy. The Therma-Tru Finishing System is available in seven popular stain colors, contains everything needed to achieve a professional finish. 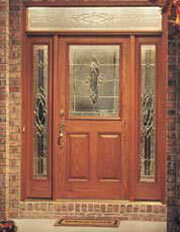 The complete Classic-Craft exterior door system carries a Lifetime Limited Warranty for as long as you own your home. Take a close look at Classic-Craft door systems and you�ll know why builders, contractors and homeowners across the country have chosen Therma-Tru as the leading brand of insulated exterior doors. Proprietary adjustable security strike plate with 2 1/2" long screws available for all units except those with a sidelite located on the lock side. For the complete Therma-Tru Classic-Craft� on-line catalog, click here ( not a PDF format ). Choose the door you've always wanted from over 200 styles, including matching sidelites and transoms. 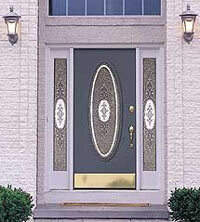 We manufacture the complete Fiber-Classic door system. All components are designed, engineered and manufactured for top-quality performance and appearance. The Fiber-Classic exterior door with a durable, compression-molded fiberglass surface won�t dent, crack, split or splinter. It resists shrinking and swelling with temperature changes allowing the finish to last three times longer than on a wood door. The complete Fiber-Classic exterior door system carries a Lifetime Limited Warranty for as long as you own your home. Take a close look at Fiber-Classic door systems and you�ll know why builders, contractors and homeowners across the country have chosen Therma-Tru as the leading brand of insulated exterior doors. 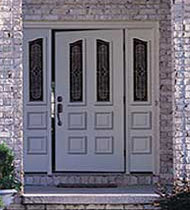 Smooth-Star fiberglass doors feature tough, compression-molded fiberglass with a smooth, paint-grade plus surface that�s superior to steel doors - Great looks, great price, won't dent Distinctive panel detail creates dramatic shadow lines Durable, smooth fiberglass surface resists damage Virtually maintenance-free exterior Smooth, paint-grade plus surface - no need for priming No need for a dunnage door Twice the warranty of steel doors Plus, a wide variety of decorative glass choices We manufacture the complete Smooth-Star door system. All components are designed, engineered and manufactured for top-quality performance and appearance. The Smooth-Star exterior door with a durable, compression-molded smooth fiberglass surface that won�t dent, crack, split or splinter. Extensive testing proves that Smooth-Star doors will stay smooth during installation, construction and years of day-to-day traffic. Smooth-Star was developed specifically to be a paint-grade plus door, because of the door�s ease of painting without the need for priming. Paint with 100% acrylic latex or 100% acrylic paint. The complete Smooth-Star exterior door system carries a 20-Year Limited Warranty for as long as you own your home. Take a close look at Smooth-Star door systems and you�ll know why builders, contractors and homeowners across the country have chosen Therma-Tru as the leading brand of insulated exterior doors. Proprietary adjustable security strike plate with 21/2" long screws available for all units except those with a sidelite located on the lock side.